IZEA is a stock that we have been following for several weeks. We highlighted this play back on August 12th, and would subsequently observe a low of 1.04. In two definitive pushes, the stock has gained quite a bit of ground over roughly the past six weeks. We’re always scraping the barrel for a good bottom play, and we want to place SNAP on watch for just that reason this morning. 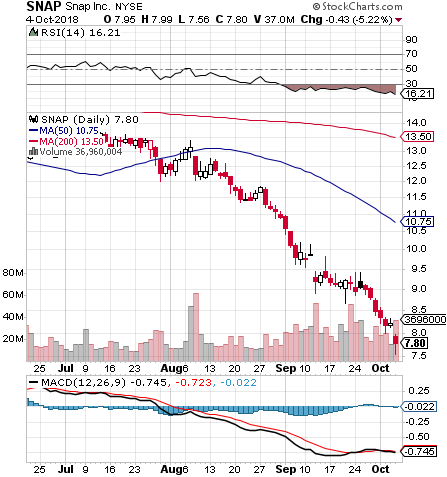 A thirteen dollar stock just two months ago as you can see on the included chart snapshot, SNAP has now fallen below the eight dollar mark, and is egregiously oversold at the present time. We’ll keep tabs on this play moving forward, as a rebound appears imminent at some point in the near future. Lastly, we want to backtrack to Monday’s report, in which we designated LODE as a stock to watch. It certainly was something to see this week as it ran from a low of .1201 to as high as .315. That’s a 162% intraweek push. 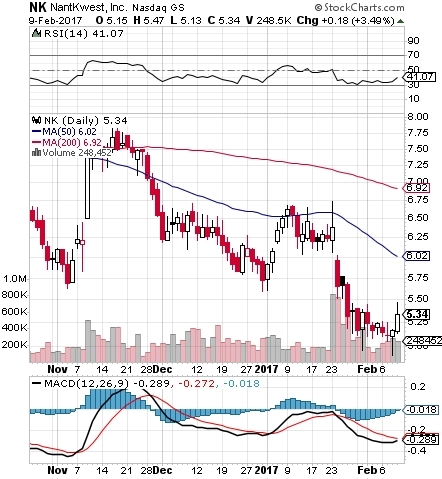 We tagged USRM in our report on Monday for the first time in quite awhile, and reported back to our readers yesterday morning on the excellent 72% push it made from .014-.0241. We also mentioned the strength of its close and increased volume, noting that we’d want to continue keeping a close eye on the stock. We noticed some heightened activity in QSIM in yesterday morning’s premarket scan, and included the stock in our extended watchlist for the day. It was a good thing that we did, because the stock put up an awesome performance, continuously ramping its way up the chart for essentially the entire session. From its early low of .0043, QSIM was shot out of a cannon and reached a high of .011 just prior to the closing bell, for an intraday increase of 156% which came on heavy volume, on the order of seven times the 30-day average. With such a bullish session, we’re certainly going to want to keep QSIM on tap for further potential moves, be it an immediate continuation of this bullish trend, or a dip-and-rip scenario. Rounding off yesterday’s top movers was VPOR. Like the previously-mentioned play, we caught this one on our routine morning scan and took note of an increase in volume and price action in the prior session. The momentum carried over nicely, with VPOR trading up from a low of .00355 and reaching .0053, for an intraday pop of 49% It marked the third straight day of higher highs and higher lows for the stock, so it too will remain on our watchlist moving forward. Lowes joined the earnings bonanza this morning with an impressive set of figures in their Q4 report. We are going to be tracking a range of short-term options to possibly take advantage of the commotion. Our targets are going to be the LOW Weekly $79-81 Calls. AEZS is gapping up this morning on the heels of some news. It’s been quite a few months since we last mentioned this stock. That was back in the fall, and we subsequently witnessed quite a surge from the stock after that. Since then, so far in 2017 the stock has come down to record new annual lows, and recently has been making incremental increases off of that bottom. In light of today’s news, described below, we think it’s a good time to put AEZS back on a more intensive watch. This morning ZSAN reported that in its ZOTRIP pivotal efficacy study, the company’s M207 transdermal migraine therapy patch met both primary, as well as secondary endpoints. It certainly explains the premarket hoopla, and warrants our observation as we kick off a new trading week. To wrap things up this morning, we want to leave our readers with a quick heads up on a big Tuesday coming up. We’ve got a special report coming out tomorrow prior to the opening bell. It could represent quite an opportunity, so tomorrow is definitely not the day to miss out on our premarket report! Be sure to stay locked onto your email inboxes or BlueHorseshoeStocks.com tomorrow between 9:00 to 9:15AM, and lean on those refresh buttons! This morning we’re taking a look back at GALT, which we highlighted as a ripening play that we felt was worthy of observation last month. 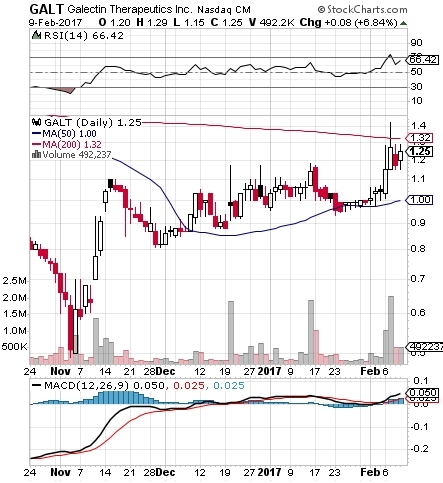 We feel these gains are sustainable if GALT can manage to crack past the current 200DMA at 1.32. As you can see on the included snapshot, the chart continues to bear the look of potential for even further increases, so we’ll stay on the lookout for that. WFM is showing some nice volatility and positive price action despite a fairly uninteresting earnings release this week. We like to follow the activity regardless, and today it’s leading us to focus on some WFM options. Rather than selecting weekly options that will expire this afternoon, we’ll go out to contracts that expire next Friday; the WFM 02/17 $30 & $30.50 Calls. The NK chart gave off a pretty good bottom-bounce signal yesterday and the day before, so we’ll be interested in tracking the action in this play over the next several sessions on the chance that it can string together a multi-session uptrend. From the chart below, it’s easy to see why we feel NK could be ripe for the picking. 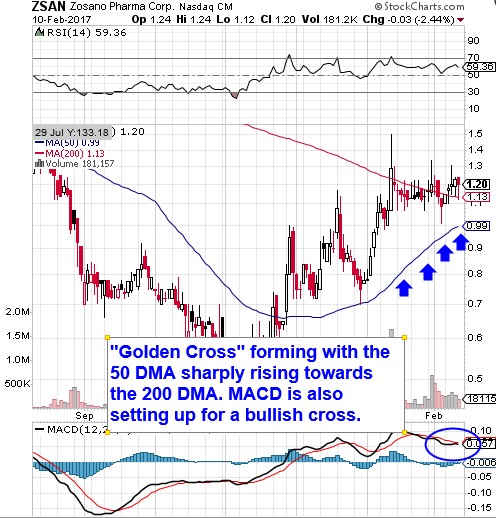 The RSI is increasing, while the MACD is a hair’s breath away from a bullish cross that generally indicates some significant move to the upside is in the stock’s near future. We’ll have our eyes peeled for that. Our first order of business this morning is to review the recent activity in MYHI, another cannabis stock amid the huge selection we’re constantly tracking. We’ve been all over this play in the month of January, beginning with the first report of the calendar year, and appearing routinely since then, all while maintaining a general uptrend. Our witnessed low came in the session immediately following that first premarket report of 2017 back on January 3rd, at .09. Over the course of this month, MYHI has streaked skyward with some very impressive multi-day surges, the latest of which led to a new high yesterday. The high mark represented an overall upswing of 900% from our observed low on the 3rd, exactly three weeks ago, so huge cheers are in order for anyone who has been along for this fantastic ride! Speaking of the marijuana space, which has definitely been a prime area of focus for us in recent months especially, we had a couple of our other running cannabis interests that were included in yesterday’s premarket report end up performing well on the day. We had Rocky Mountain High Brands, Inc. RMHB trade up from .13 to .16 for a modest 23% intraday push, reaching overall gains of 74% from the .092 low we observed after including the stock in Friday’s report. 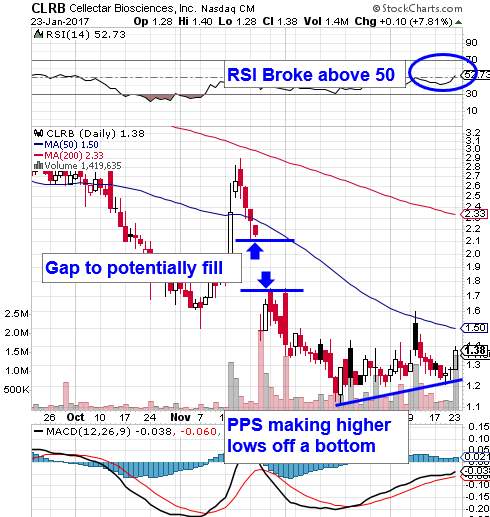 CLRB is hitting our scanner in the premarket today, gapping up to the tune of 15% and showing all the symptoms of a solid bottom-bouncer. There is a gap on the chart between approximately 1.80 and 2.20. We would like to see the stock maintain support above the 50DMA(1.50) and potentially make a run to fill that gap. We’ll continue to track these ideas for the possibility of further increases for as long as gold itself can maintain its overall uptrend. In this case, that would likely mean holding support above the $1200/oz mark.